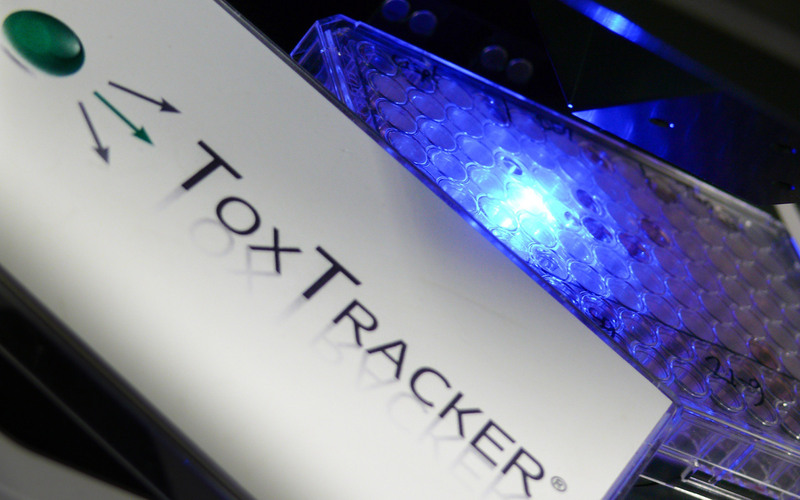 Toxys has developed ToxTracker and ToxTracker ACE, unique flow cytometry-based assays that identify various genotoxic and non-genotoxic properties of chemicals and pharmaceuticals that are associated with increased cancer risk. To accommodate in-house use of the assays Toxys now also offers them as a kit. The lab interested in using the assay will first be trained and validated as ToxTracker certified laboratory. After certification the kits can be purchased as required (each kit is sufficient to test 8 compounds +/- S9 in triplo) to allow flexible use and extensive insight into (geno)toxicity for your compounds. Currently a ringtrial for ToxTracker is ongoing, for this the assay has been transferred to 8 laboratories for independant testing. The results from this ring trial form the basis for an OECD application for ToxTracker. The protocols for the assays have been established for the ring trial, and so far the assay has been succesfully transferred to the participants. In a smaller validation study we have run previously we also installed the assay in 2 laboratories, the results demonstrating the transferability of the assay are available in this publication presented at the SOT 2018. “As a modern safety laboratory requiring mechanistic insights into mammalian toxicology, we adopted ToxTracker and installed the assay in-house. The expertise, training and support provided by Toxys for the technology transfer were excellent resulting in a seamless set-up of the assay in our facilities. In addition, we have had terrific reactivity from Giel and his team with our questions..
We are very proud on the consistency and quality of the ToxTracker assays. To guarantee the same for our customers using the assay in-house we only offer the Kits to labs who have had the training and have been certified (certification is included in the ToxTracker starter package). The training entails a 3-5 day on-site visit from one of our scientist who will perform a hands-on training. You will gain experience with culturing the cells and performing the analysis. After the training you will be able to perform the assay yourself. All relevant documents, such as calculation sheets and protocols will be shared before the training. By testing a number of reference compounds we will assess whether results are in line with our expectations and quality criteria. When this is finalised you will get a ToxTracker certification allowing you to order further ToxTracker Kits. If you are interested in using one of the Kits in-house or need advice on which kit would be most suitable for your project please contact us via the button below of by sending an email to orders@toxys.com.